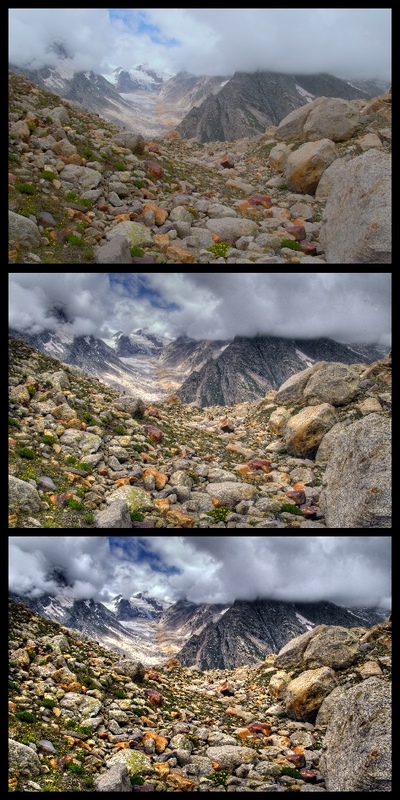 Imagine you are staring at a magnificent mountain scene – blue sky, dramatic clouds, glaciered peaks, rocks of varied hue. You take a picture but when it’s processed you are disappointed. The sky and glaciers show up clearly but everything else is dark or black. Every photographer has experienced this kind of disappointment. It happens because the range of brightness of objects outdoors is usually higher than a camera can capture or a sheet of paper can reproduce – typically a thousandfold higher or more – so the photographic process must squeeze and truncate the tones to make them fit. Digital processing can dodge some of this problem (see “Reality and Digital Pictures,” 12-Dec-05) and now an application can tackle it directly: MultimediaPhoto’s Photomatix. As you can see from the before-and-after photo of just such a scene, it works like magic. Dynamic Range — The range of brightness of a scene or an image is called its dynamic range. A sunny scene will likely have a dynamic range of at least 100,000:1 and its range can exceed 1,000,000:1. In contrast, image sensors can record on the order of 1,000:1 (DSLRs) or 100:1 (other cameras), and paper can display a range of only about 100:1. The range of computer monitors is roughly comparable to that of paper. Note that these are two different problems: (1) the dynamic range of a scene can be greater than a camera can capture and (2) the dynamic range of a digital image can be greater than paper or screens can reproduce. 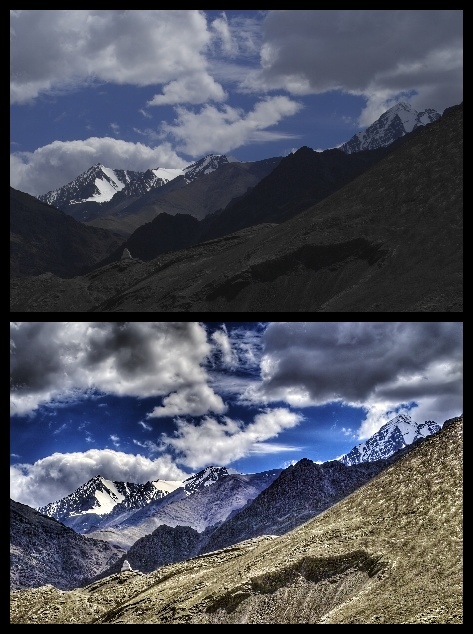 Both of these are problems of high dynamic range (“HDR” in jargon) but the meaning of “high” depends upon the context. There are no established conventions for the use of the term and there is no standard HDR format. In principle, the first of these problems has a simple solution. If one exposure records too narrow a range of tones, first take enough exposures to record the entire range then tell a computer to combine the overlapping exposures. To combine them you can take some form of average, or you can take light tones from one file and dark tones from another, or you can create an image with sufficient bits to describe every tone in both. In practice these solutions may need some fiddling because the tones in an image are neither perceived nor recorded in neat steps, but in principle they are straightforward. The second problem is incomparably more difficult. Consider what it might mean to compress tones tenfold. It happens that photographs in newspapers display a range of reflectance from highlight to shadow of about 10:1. Let’s say that you photograph a man reading a paper. If all of the photo’s tones are compressed tenfold, then you are likely to see a man reading a sheet of grey. Tonal Compression — High tonal compression is quite a trick, yet Photomatix does it. Photomatix performs its magic like a magician, by directing the viewer’s attention. The eye cares little about subtle gradations and minuscule detail; the eye looks for clear contrasts between adjacent tones. “Local contrast” is the jargon. Most of the information we take from a scene comes from local contrast. Photomatix makes sure that we notice this local contrast and slips through the compression on the side. Where it finds clear contrasting tones, first it enhances them and then it compresses the rest. Although this function is intended for squeezing HDR pictures onto paper – well, any magician who can saw a woman in half can also pull a rabbit from a hat. 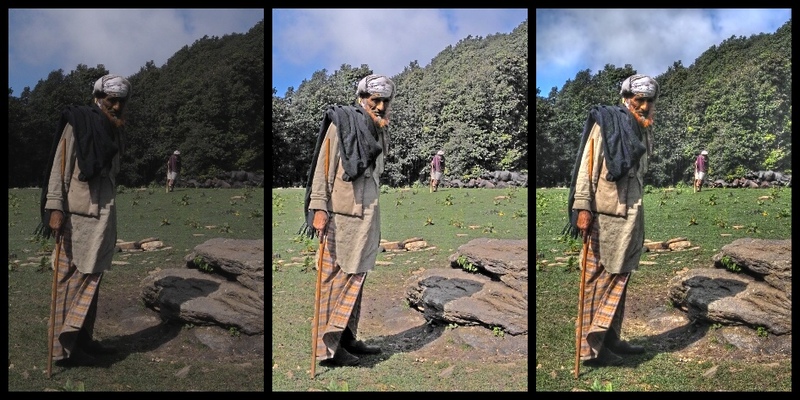 Local contrast carries most of the information in every picture, not merely in pictures with a high dynamic range but also in pictures with a low dynamic range. Enhancing local contrast within a dull photo can increase its apparent dynamic range. For an example of this, look at these three pictures. All of these carry the same range of tones. The top one shows the raw file. It contains the highlights and shadows needed to show three-dimensionality, but the lighting is so flat that the highlights and shadows are difficult for the eye to see readily or for ordinary manipulations to bring out. In the middle picture Photomatix has enhanced those contrasts to turn a dull photo into a decent one. The new contrasts I was able to enhance further by conventional means to make the finished picture at the bottom. I usually use the plug-in, because I work with Photoshop CS2 and rarely combine exposures. I have combined some photos to stunning effect but the Foveon sensor in my DSLR has a sufficiently broad dynamic range that I seldom want to do this and when I do, usually I cannot because the camera is not on a tripod or the subject is not dead still. Images from cameras with a smaller sensor would benefit from this treatment more often, as might scans of film, but I would not expect it to be an artistic panacea, not even when the camera is on a tripod and the subject is stationary. That’s because if a scene shows extremes of contrast, it will likely look unnatural if the photo replaces the extremes with moderation. You can see an example in these photos of a rain forest. 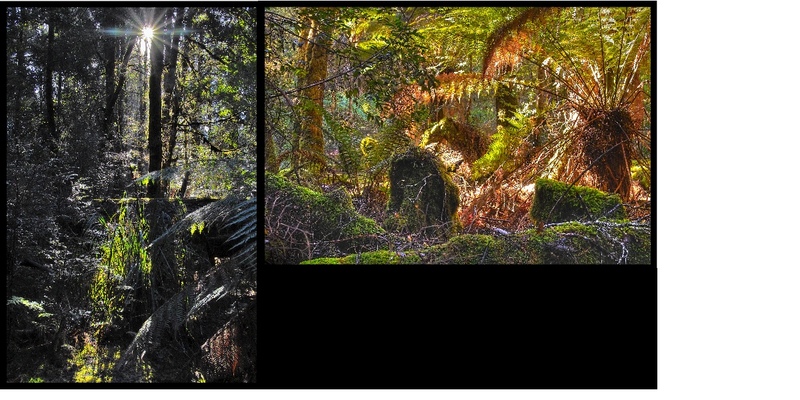 On the left, a single exposure captures the extreme contrast of the forest but loses the range of colour in the shade. It shows the forest but not the trees. On the right, a combination of two exposures shows the trees but not the forest. Since I seldom combine images, I cannot compare Photomatix’s combining functions with the equivalent features of Photoshop or other products. I can say, however, that Photomatix’s tone-mapping strikes me as more sophisticated than the equivalent functions in Photoshop or in any other plug-in I know of. Sometimes the tone-mapping from Photomatix seems too dramatic, but I have found Photomatix to be so helpful so often that I have learned to try it on almost every picture I take, to see what it will do. The First Step — An image re-mapped with Photomatix is a starting point, not a finished product. After re-mapping an image – which must be done before anything else – I still need to adjust it in all the usual ways, just as I need to after adjusting it with Photoshop’s shadow/highlight control (see “Editing Photographs for the Perfectionist,” 27-Sep-04). Also, enhancing detail in shadows and highlights enhances noise as well, so the image ends up needing an unusually thorough cleaning. A specialized noise-reduction package like Noise Ninja I find to be essential. Although Photomatix is an excellent product, it is still a young one. The developer is still tinkering with the algorithms and the user interface. On my computer the plug-in and application have both been stable, but occasionally they have not behaved quite as expected and the processed image does not always look quite like the preview. However, the developer is a single person who handles sales and support as well as programming, so she does not sweep problems under a corporate rug; she deals with them. The latest releases (1.1 for the plug-in and 2.3 for the application) appear to be significantly cleaner than the last ones. Demo versions are free for the downloading.